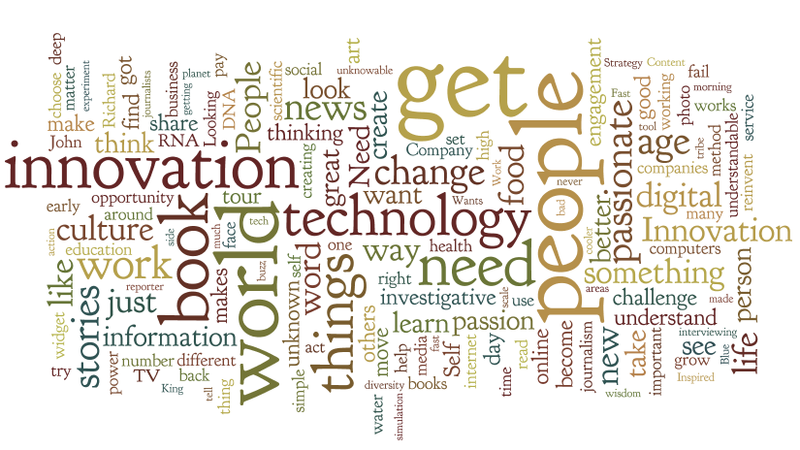 Above is a Wordle of my notes from the 2-day BIF-6 summit. I’m not surprised to see that “people” is the largest word; because more than innovation or technology, it’s what people do that matters the most. The second day of the conference started with Richard Leider, Founder and Chairman of The Inventure Group, who has studied the power of purpose for 40 years. He looks at what makes people get out of bed in the morning. When the elderly are asked what they would do differently in their lives, it came down to three themes: 1) be more reflective, 2) take more risks (authenticity and voice), 3) understand own bottom line/what matters to me. Leider says that the two most important days in your life are the day that you are born and the day that you discover why you were born. Tired of waiting for the government to take action? Ben Berkowitz created a website SeeClickFix where citizens can take a photo, report a non-emergency issue such as a graffiti or a pothole and track if it gets fixed. As Ben said, “Potholes are gateway drug to civic engagement” – so go ahead and load the app for Blackberry, iPhone or Android. 74% of Americans don’t volunteer and Jason Colker, Founder and CEO of The Extraordinaries is looking to change how people can get involved. He has created Sparked.org which looks to match the needs of non-profits with the expertise and cognitive surplus of professionals through micro-volunteering. Former Deputy Director of the CIA, Carmen Medina, discussed being a change agent for a large organization. She passed on the advice that she was given which is that we need to stop being uncomfortable being a “heretic” and to fully embrace it and like it! She equated innovators to an internal rebel alliance which management must tap into. Dale Dougherty, editor and publisher of MAKE magazine, talked about the difference between understanding and doing. His magazine is a kind of reboot of Popular Mechanics. He also has a Makers Faire which is are gatherings of people sharing the technology that they “play” with. Below is a short video from the mini Makers Faire that they held at the Hotel Providence after the conference. The final storyteller of the event was Founder and Chairman of SYPartners, Keith Yamashita who posed the question: Is it really worth daring to be great? People grow up with a “null set” hypothesis and think that life is about going ever upward, onward and becoming more successful. Life is not linear and when there is a break in the expected path, it is a shock to the system. The first piece of being great starts with “you” – each person on the planet. Kids are born to greatness and simplicity, we unlearn greatness and make things complicated. The way to be great is to be fully aware and fully alive when people say NO. Yamashita says that we need to end the tyranny of the false trade-off. In the past it was believed that there was infinite possibilities and infinite resources. During the recent economic downturn there has been talk of finite possibilities and finite resources. The real answer going forward is that there are infinite possibilities and finite resources (echoing Ntiedo “Nt” Etuk who said we don’t lack resources, we lack resourcefulness). We have no other choice but to try and be great. The audio of the stories mentioned above and from the rest of the conference are available on the BIF website (videos are expected in the coming weeks). I recommend that you take a listen to the segments and check out some of the other blog posts from the other attendees. I’d welcome and feedback or question that you have about the event. BIF-6 rocked! Disclaimer: I attended BIF-6 on a free blogger pass which gives me free admission (conference includes meals and a copy of Hsieh’s book). I am under no obligation to write. What happens when you pull together 200 people who are passionate about innovation, put a broad spectrum of storytellers in front of them and give them an intimate setting to interact? This is the idea of the 6th annual Collaborative Innovation Summit of the Business Innovation Factory (BIF-6 for short) at the intimate setting of the Trinity Rep Theatre in Providence, RI (photo on the right of MC/Chief Catalyst Saul Kaplan on stage). Saul started out the conference with a warning that “innovation” must not become a buzzword, or no one will be innovative. There were no silver bullets in the stories, but rather compelling unique perspectives on innovation, passion and ideas to help change the world. Access to information is not a problem. As Fast Company founder Alan Webber stated, “Content isn’t King, Context is King”. Webber talked about the media industry and how news is in full retreat since information is becoming a commodity. The problem is that there are few original voices and too many fake themes in the news. The real value that is needed is not more people with opinions, but the context to make sense of the news. The challenge is that not only do we need people who can do deep investigative reporting, but also an audience that is willing to consume it and a market that can support it. One success story was shared not long later in the form of the pair of photojournalists Peter Menzel and Faith D’Aluisio. They have travelled the world, taking photos and telling stories about food and cultures. Their book What I Eat: Around the World in 80 Diets has photos, stories and a breakdown of the caloric intake – a nice mix of visuals, analytical data and emotional stories. When telling their stories, they have to balance their desire to weave in a narrative vs. simply letting the stories come through. Menzel’s advice is read the coverage, look at the photos and to think for yourself. Sound advice for everything that you read. 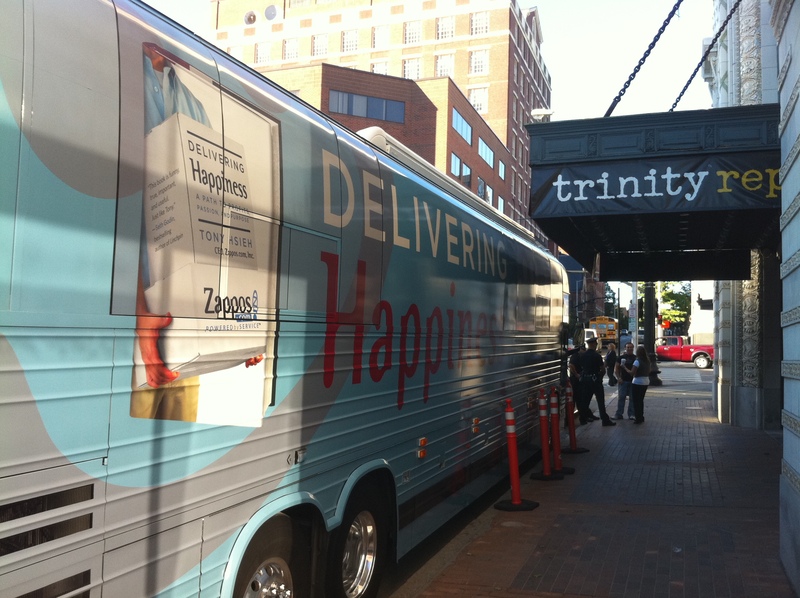 Zappos CEO Tony Hsieh rode into Providence on the Delivering Happiness Bus Tour (photo on the right). Zappos is a $1 billion success story, but Hsieh says that their success has nothing to do with shoes or online sales, rather it comes from the passionate engagement of his employees to the company mission which is to provide the very best customer service. Zappos posts their core values on their website – #9: Passion Is The Fuel That Drives Us And Our Company Forward. He said that company culture can create sustained high performance and that if you get the culture right, the rest will happen naturally on its own. Author John Hagel (see 10 take-aways from his book, The Power of Pull) stated that there is not enough depth or understanding of passion. In facing unexpected challenges, without passion, obstacles will be hidden or ignored rather than conquered. Hagel quoted a recent study that only 20% of the workforce is passionate and that the number of passionate people is inverse to the size of the organization. Most companies only thinking about breakthrough technology or product innovation, they must also think about organizational (culture) innovation. Babson President Len Schlesinger said that we have two options – sit and think or act. In face of increasing uncertainty, the traditional way of thinking our way into action doesn’t work. Entrepreneurship is the best tool we have, it equals action. Don Tapscott (who was a big inspiration to start me blogging when he attended EMC’s first Innovation Conference to discuss Wikinomics) presented via Skype to share the story of how he got into digital media and to discuss his latest book. In 1981, Don was ridiculed for saying that computers would change the world since no one believed that managers would ever learn to type. In his latest book, Macrowikinomics, he states that the industrial economy has run out of gas and that the internet has come of age. Lots of institutions are stalled and they need more than a tweak; they must be reinvented around collaboration and openness. There were so many great quotes and stories that need to be shared and integrated into action. As Saul said in his introduction, his goal is for Innovation, Collaboration and Experimentation. 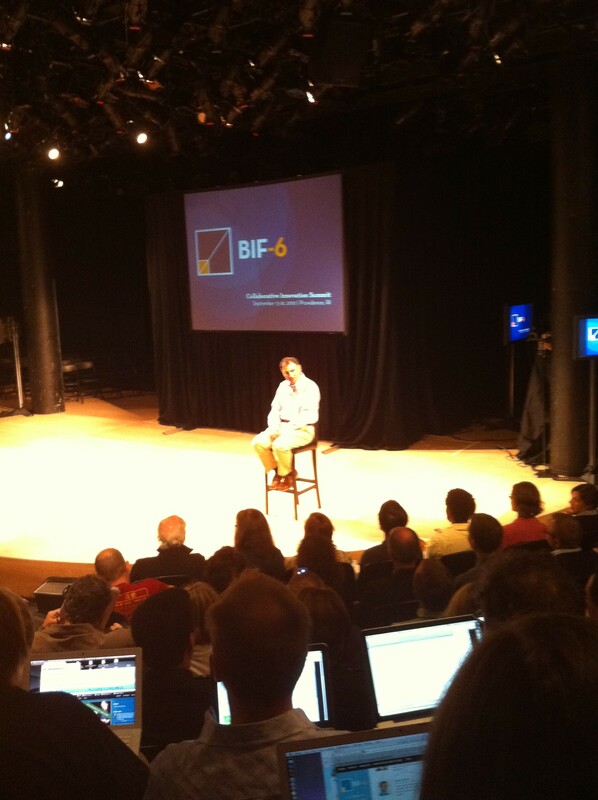 The videos from the event are expected to be up in the next 2-3 weeks, so be sure to check the BIF-6 website. Disclaimer: I am attending BIF-6 on a free blogger pass which gives me free admission (conference includes meals and a copy of Hsieh’s book). I am under no obligation to write. On Technology: “vAgents of Change. Virtualization is still relatively new to IT, but it has clearly crossed the chasm into a mainstream product line with 190,000 customers. Leading the charge to deliver virtualization around the globe are 50,000 VMware Certified Professionals. 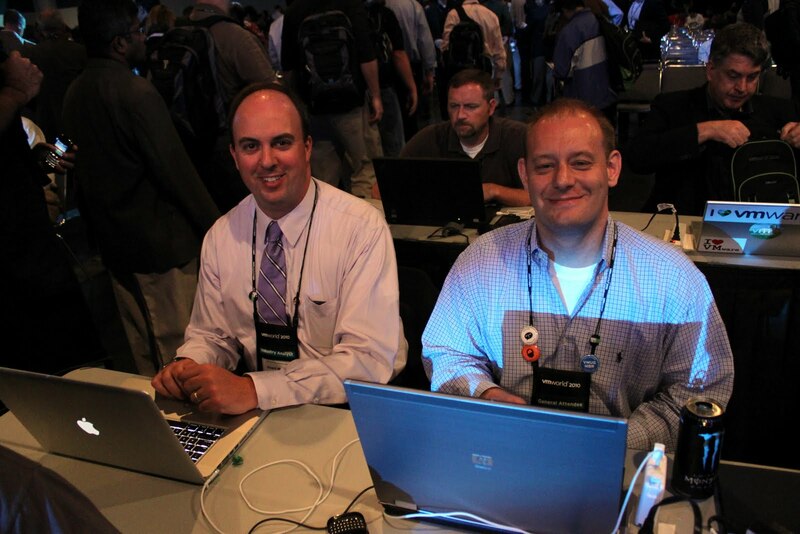 The culture of the virtualization community goes far beyond understanding a few products, as can be seen by the volunteer group that puts together the VM User Groups (VMUGs) and the passion of the vExperts. Will these expert ambassadors of virtualization embrace and drive the change to cloud computing?” – see the full post for my take on ITaaS, Ecosystem, Mobility and xSPs. Lots of video – I was part of the SiliconANGLE live broadcast during the conference. I did three segments live (Ed Bugnion of Cisco here, Abner Germanow of Juniper Networks here and Bob Zuber of IBM here), plus 2 recorded segments: with EMC on the journey to the private cloud and Cisco blogger round-up of convergence, VMworld awards and more. I announced a new Wikibon award today which was inspired by Cognitive Surplus by Clay Shirky. “Positive deviants are those who behave better than the norm, even when faced with similar limitations or challenges.” The PosDev award is “to celebrate those who create a positive impact on the IT community through a collaborative process of sharing information and providing critical thinking on the business and technical challenges of the day.” The idea of the award is to inspire more people to collaborate and share information – read the full post here. The PosDev award is an idea that I hope to spread (hat tip to TED – “ideas worth spreading”). Speaking of great ideas, next week (Sept 15-16 in Providence, RI) I will be attending BIF-6, the summit of the Business Innovation Factory. BIF is a 2 day event with a fantastic line-up of storytellers in an intimate setting. You can get a taste of the event from the free “story book“, plus they will be streaming the event live and you can follow the #bif6 hashtag on Twitter. I’ll be looking to share what I hear and see how it can connect with IT trends and communities. It’s hard to believe that I’ve got a full quarter at the new job. I’d like to say a heartfelt thank you to everyone that has been so supportive. I’m very easy to get in touch with, so don’t hesitate to reach out if you have a person or topic that I may be able to help with. You are currently browsing the Blog Stu - Stuart Miniman blog archives for September, 2010.